Only one hours drive from Cape Town, lies the Worcester section of the Breede River Rafting. It offers a dramatic landscape where the fast flowing channels and delta’s of palmiet interchange with long dark pools and willowy banks. 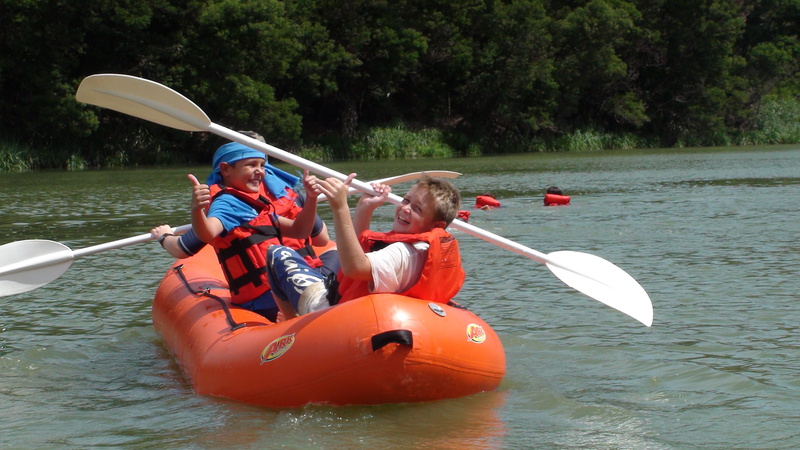 The cruise is ideal for first-time Breede river rafting clients. We take care of you from beginning to end. Whether it just be for a weekend getaway, team building expedition or just a bit of environmental awareness. Our put-in point will see you onto the river through a maze of channels and into fast-flowing streams under overhanging trees. Spend the day on the Breede river; drifting, sunbathing, swimming and generally enjoying yourself. We provide hearty, wholesome meals on the banks of the river, which can be enjoyed at leisure, accompanied by pre-arranged wines from the Worcester valley back in our base camp. This river rafting adventure is suitable for young and old, swimmers and non-swimmers, fit and the not so fit. We can cater for all your requests just to make your trip even more special than Mother Nature has intended. Escape the city blues on a magical rafting trip on the tranquil Breede River. This day trip will give you an excellent overview of the unique riverine eco-system of the fertile Breede River Valley. Close to Cape Town (1½ hours), this relaxing trip offers superb vistas of the mountains of the area, prolific bird life and time to admire nature’s bounty with friends and family. The itineraries are flexible and can be customized to meet the needs of your group. All equipment – rafts, paddles, lifejacket, barrell/dry bag, coolerbox; Quailified guides; light breakfast and a lunch. Beverages – alcholic and non-alcholic; snacks on river. Beverages: Water (2l per person per rafting day) / soft drinks / alcholic beverages in cans or plastic contaners – we do not allow any glass bottles on river. Please do not hesitate to contact us should you require further details.